On Friday, June 23, 2017, MLA Members for Justice in Palestine posted a statement protesting the MLA’s ratification of Resolution 2017-1. The anti-BDS resolution, which calls on the association to refrain from the boycott of Israeli academic institutions, was ratified as it barely reached the 10% threshold of member votes (1,954 out of 18,279 members voted in favor of the resolution) required by MLA bylaws. While the vote suggests threshold of mobilization of pro-Israeli constituencies within academia, and constitutes an upsetting setback for the academic boycott movement within the MLA, the ratification of resolution has little political significance generally, as criticism of Israel’s policies increase and support for Palestinians gathers renewed legitimacy among students and academics across the US. 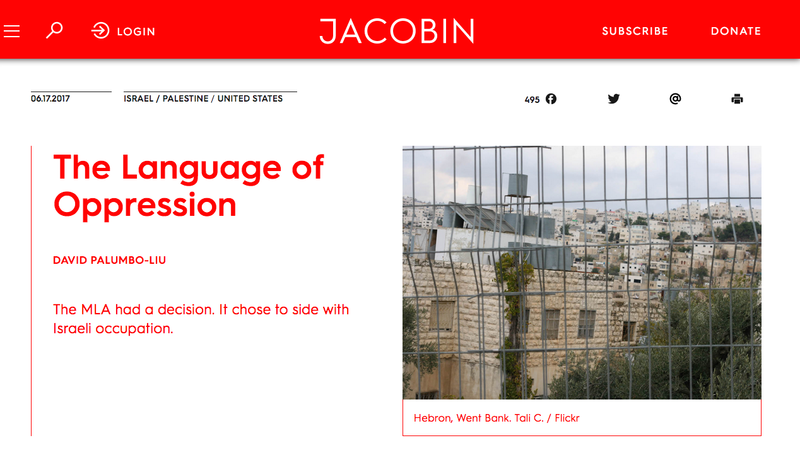 David Palumbo Liu’s “The Language of Oppression” (Jacobin July 16, 2017) provides an insightful report on the vote results. After a series of successes, this result represents an unfortunate, but not dispiriting, setback for the academic boycott movement within the MLA. Setbacks are not uncommon for Palestinians or anyone committed to advocating Palestinian rights. Palestinians have suffered an almost endless series of defeats at the hands of the Israeli military, but affirm their right to exist in Palestine, forging a remarkable culture of resistance that stands in opposition to Israel’s ruthless colonialism. MLA Members for Justice in Palestine remains committed to promoting Palestinian literature and culture, advocating Palestinian human rights, and working with other academics in opposing injustice. The group is exploring how best to respond to this setback and will soon be issuing a public statement. Click to VOTE NO on Resolution 2017-1. Voting on MLA Resolutions ends at Midnight on Thursday June 1, 2017. Click this link to sign the petition against MLA Resolution 2017-1. Timothy Brennan is a professor of Comparative Literature, English and American Studies at the University of Minnesota. He is also affiliated with the Institute for Global Studies and the Institute for Advanced Studies. He is the author of Secular Devotion: Afro-Latin Music and Imperial Jazz (Verso, 2008), and edited, introduced, and co-translated the first English edition of Alejo Carpentier’s classic study, Music in Cuba (U of Minnesota P, 2001). Other books include Borrowed Light, Vol. I: Vico, Hegel and the Colonies (Stanford UP, 2014), Wars of Position: The Cultural Politics of Left and Right (Columbia UP, 2006), Empire in Different Colors (Revolver, 2007), At Home in the World: Cosmopolitanism Now (Harvard UP, 1997), and Salman Rushdie and the Third World: Myths of the Nation (Macmillan, 1989). He was named Russell Chair in the Humanities in 2014. He has chaired the Sociological Approaches to Literature Division of the Modern Language Association (MLA). His essay (co-written with Doug Rossinow) on the Israel/Palestine conflict was the featured article on Yahoo.com in 2003. Resolution 2017-1, which suppresses debate over Israel within the MLA and, indeed, is intended to prevent any public statement by the organization critical of the Israeli state is itself an outrage and a betrayal, of course, of everything the MLA nominally stands for. I recall seeing signs of this kind of cynicism and political intolerance in the MLA earlier as a member of the Delegate Assembly during the debate over Ward Churchill. It is a mood very much in the spirit of the United States’ more general rightward turn, but now taken up enthusiastically, it appears, by a frustrated sector sick-and-tired of critical thought, angry at its own professional disenfranchisement, and eager to get revenge on the humanities’ earlier progressive commitments. Added to this, of course, is the very faux-patriotically American desire to support Israel whatever it does, insulated from any of the criticisms that even supporters of this proposal would normally mount against other states. This effort to censor — and even to render permanently invalid – the richly deserved condemnation of Israel’s violations of international law and its unspeakable treatment of Palestinians, is disgraceful, and would embarrass the organization in the eyes of many here and abroad. Many of us – I know I am not alone – have been long disenchanted with the MLA’s overpaid administrative staff (who apparently are in their positions for life), the unconscionable cost for students and faculty to attend its annual convention, the relative lack of intellectual substance or discussion at this convention, and the cliquishness of its publishing organs and official hierarchy. The MLA has an opportunity to redeem itself by defeating this proposal. Why should we remain in the organization if it does not? MLA Members for Scholars’ Rights, lead by Russell Berman and Cary Nelson, is a small group of academics that Israeli agencies and pro-Israel lobby organizations in the US have endorsed in the battle against academic boycott. 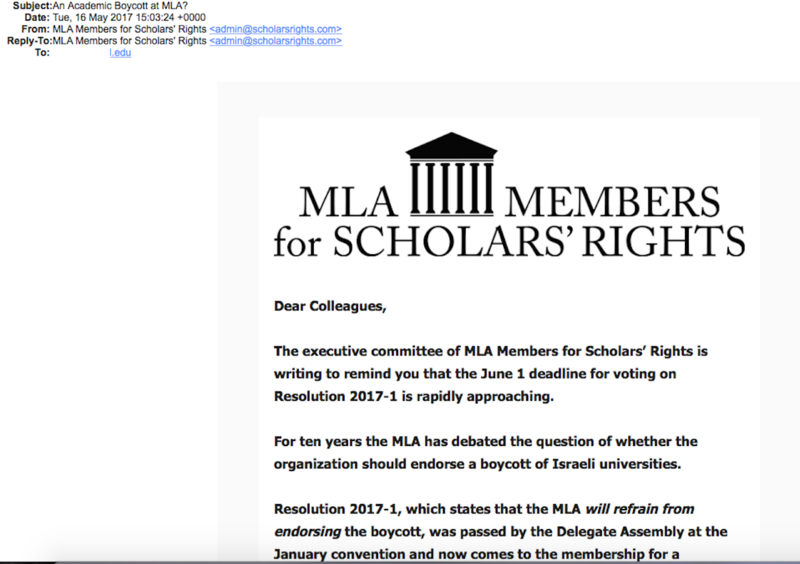 Scholars’ Rights came into existence primarily to oppose MLA Members for Justice in Palestine and seeks single-mindedly to undermine solidarity with Palestinians among academics. Behind its shallow liberal discourse on academic freedom, the Scholars’ Rights group engages in all manner of misinformation and misrepresentation to defend Israel from growing public criticism.